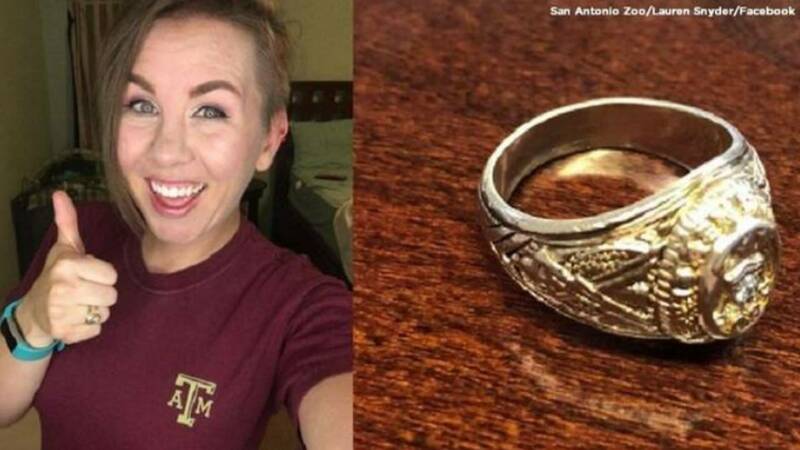 SAN ANTONIO - When Lauren Snyder lost her class ring last July at the San Antonio Zoo, she figured she wouldn't ever see it again. That's when the Internet came in to save the day. The zoo posted a picture of the 2008 Texas A&M class ring on its Facebook page Monday after a zoo worker found it in the mud at Kronkosky's Tiny Tot Nature Spot. Lauren Starnes' name was inscribed on the ring, so the zoo called on Aggie Nation to find its owner. A few hours later, the zoo posted a picture of Snyder with the ring on her finger. Snyder also lost her wedding ring, according to KSAT.